The incumbent platforms lead the polls, yet clear and significant support is shown for new innovators. The ‘Trading Intentions survey 2015’ was conducted across 24 buy-side firms with €11.2 trillion/ US$12.15 trillion in assets under management based in Europe and the US. The respondents – global heads of trading, regional heads of trading and senior fixed income traders – completed a survey detailing which liquidity aggregation systems they currently use for trading corporate bonds, which they preferred, which they planned to use and how their use might vary over a five-year period. 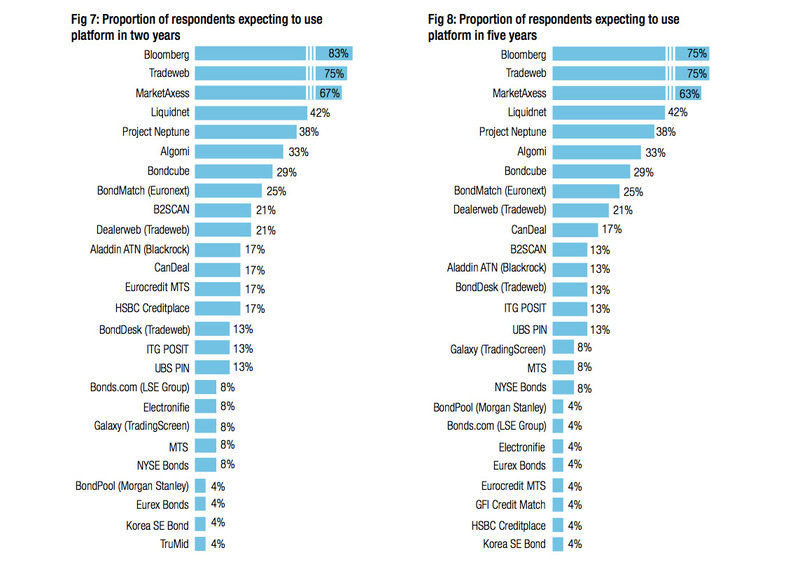 We named 50 platforms, with an option for respondents to include others. These are not all competing platforms; the terminology ‘liquidity-aggregation’ allows tools that assist with pre-trade to be considered alongside those that match orders and those that execute orders. It is likely that several tools may need to be used to optimise liquidity discovery. In addition to the quantitative data, several traders gave us their time to discuss the thinking behind their selection process. Amongst these traders, the current level of fragmentation was broadly expected to decline over the five-year period covered by the survey. Some thought this reduction would result in a handful of global platforms surviving, alongside regional specialists. Others thought that either a handful of generalists would compete offering a range of different models, or that model ‘champions’ could emerge. The take-up of corporate bond trading on crossing networks is not expected to happen quickly due to the low turnover and high number of instruments. Allowing buy-side-to-buy-side crossing: All-to-all is agreed to be a must, but purely buy- side-to-buy-side trading is also highly valued by several traders. Mandatory, automatic blotter scraping: Hoping that buy-side traders will contribute is too optimistic. They are busy and any lag in frequency of contributions to a platform will lower the success rate for matching orders, leading into a cycle of failure. Understanding and being able to interrogate the ownership structure: The sentiment from several respondents towards a sell-side owned platform that facilitated buy- side-to-buy-side crossing was negative. An independent clearing and settlement agent: A liquidity aggregation system owned by one investment manager may be acceptable but is not neutral and post-trade processing ought to be handled independently. However respondents were far from harmonious. Where some saw the use of a platform operated by a rival investment manager as problematic, others made the case for such a model, with necessary organisational separation from the parent, as offering real hope. The view of information gathering platforms was equally contentious. some traders were concerned that the value of the information given up would not be received back by the investment firms, a similar issue to the concern that exists around paying stock exchanges for trading data. “The fact is that you are building them an incredibly valuable asset and you don’t own it,” said one trader. Others said that the ability to see this information aggregated together was invaluable and in the short term provided one of the better ways of finding a match while reducing information leakage. In one year most said that the number of platforms should have reduced but as the survey shows, there are still many horses in the race, some barely out of the box yet way ahead in the betting. 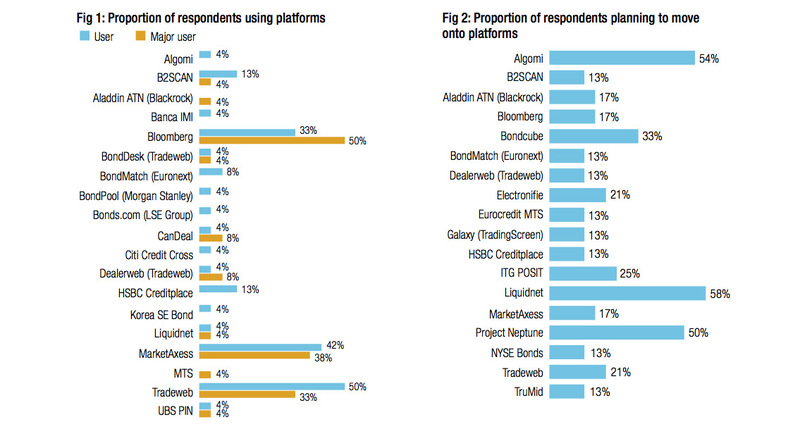 Respondents were users or major users of 19 platforms from the 50 named in the survey (Figure 1). The leaders in this area were not a surprise, with the three market leaders – Bloomberg, MarketAxess and Tradeweb – racking up comparable levels of users/major users. Where do you plan to trade? The next question asked where firms planned to find liquidity. In Figure 2 we have published the proportion of respondents planning to move to platforms where that figure exceeded 10%. It is striking that 18 platforms have achieved this level of support and of those seven are supported by 20%+ of respondents. Of those not shown, ICAP’s Brokertec, Eurex Bonds and State Street’s FI Cross deserve an honourable mention for each garnering support from 8% of respondents. 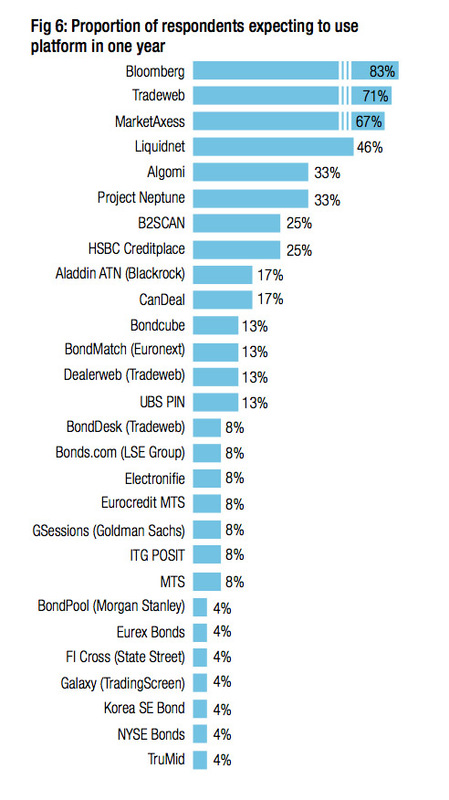 Of the trading venue model platforms, Liquidnet, Bondcube and ITG POSIT are the most keenly supported. Of the information transfer platforms designed to facilitate liquidity discovery, Algomi and Project Neptune are currently frontrunners. Which is the best route to liquidity? Several questions were asked of respondents to rank the tools they currently found most effective at pooling liquidity, which they would prefer to see liquidity pooled on and which group might have the greatest influence over improving liquidity in the market. With a rank of ‘1’ being highest, Bloomberg is identified as the most effective system at present (Figure 3). However, the preferred platforms paint a more complex picture. The top three incumbent platforms retain the confidence of the traders, with Neptune and Liquidnet also highly preferred (Figure 4). Close behind, but uncharted, was Algomi, with Bondcube, Aladdin and electronifie slightly further back in that order. This suggests that the models these firms offer are grabbing the attention of the traders and may yet see significant growth in the short term. One unresolved question this raises is why Aladdin has not achieved greater acceptance given the positive reception it receives. 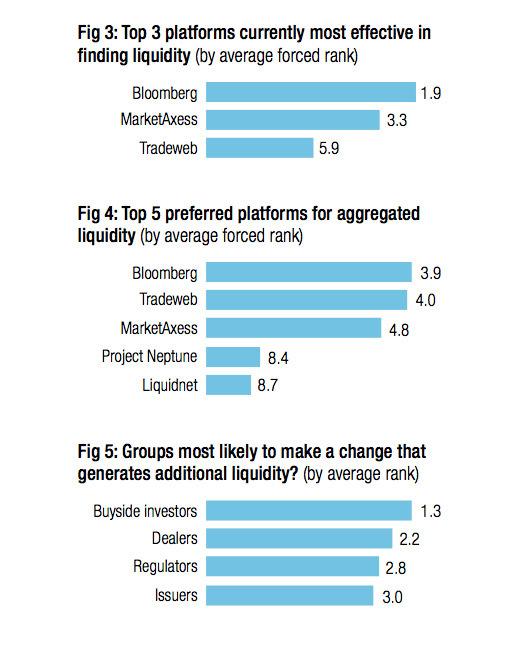 Finally the respondents were asked which groups might deliver additional liquidity into the market (Figure 5). There are limits to the extent that trading platforms can enhance liquidity, given the lack of inventory in the sell side. 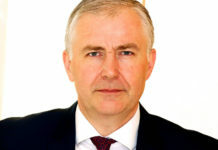 A paper issued by BlackRock in september 2014 suggested that a change to the issuance process, resulting in a reduced number of instruments would prove most valuable. In this survey the buy-side clearly takes the responsibility upon its own shoulders. Where will you be trading in the future? Several responses to this question were caveated with ‘ifs’ and ‘buts’ at the five-year mark, due to the number of factors that could impact the market over that period. As a consequence most firms see the scale of support voiced in Figure 2 reduced across Figures 6, 7 & 8. Nevertheless, there is clearly a polarisation of opinion from the one-year mark to the five-year mark. In conclusion, the incumbent platforms are clearly valued by the buy-side credit desks and will continue to be. As the investment management community attempts to overcome the falling liquidity levels in the corporate bond market new models are being embraced. Many of these will be run in parallel as the market attempts to identify the most efficient systems and critical mass determines where liquidity finally settles.